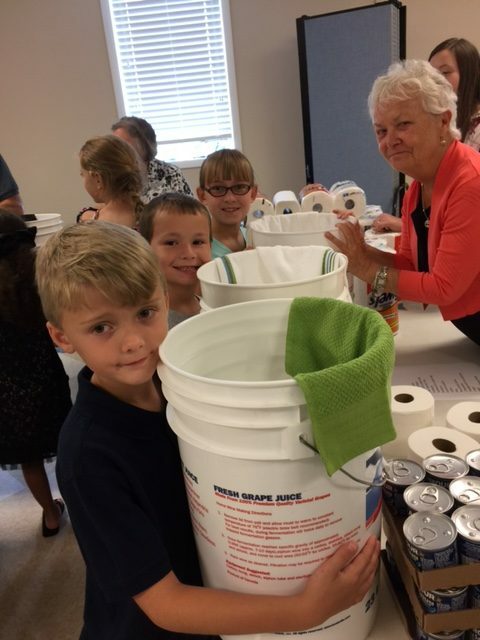 Over 40 adults and children gathered Sunday afternoon to fill 75 buckets with toiletries, water, towels, snack foods, and other essentials, including a Bible, for flood victims like those in Texas. These blessing buckets are carried by God’s pit crew, a relief organization out of Danville. They have already sent a tractor-trailer with 1700 buckets to the area. 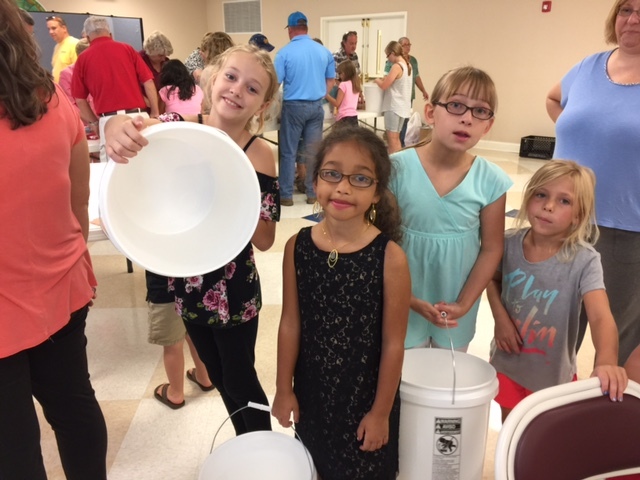 Organized by Bethlehem’s children’s ministry, the blessing buckets event was a joy filled and enthusiastic time for all involved. 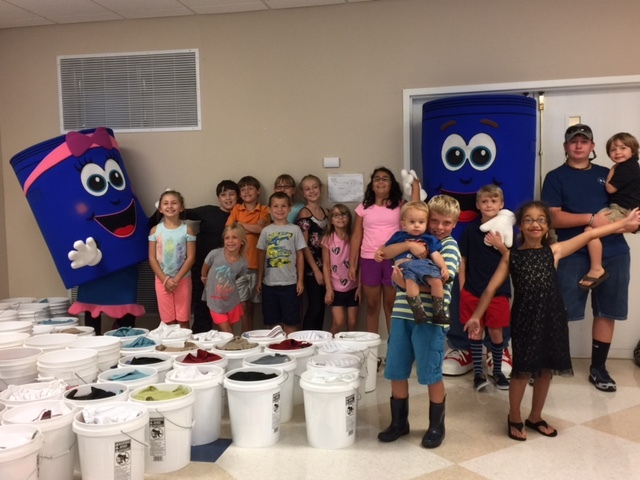 Special thanks to those who donated funds to purchase the items needed in each bucket. Dozens more photos on Facebook. Check it out!! Our Children’s Ministry focuses on meeting the needs of our children, as well as the Children of the Community, during the morning Worship Service and special events throughout the year. Holiday celebrations, educational programs and mission opportunities concentrate on helping our children become Disciples of Christ. We offer a place where children can find unconditional love and care they so desperately need to grow and thrive. 2017 Childrens Christmas Pageant…….The children and youth presented “The Case of the Reluctant Innkeeper” during both worship services on Sunday December 17th. 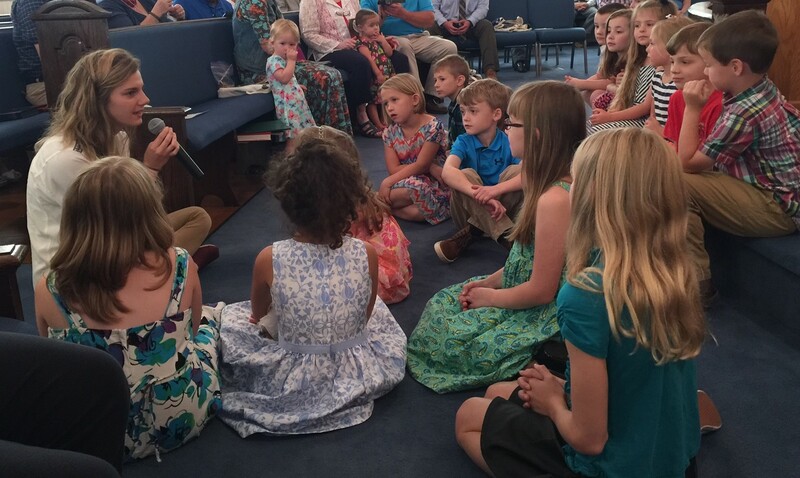 Nursery care is available for infants through age 2 during Sunday School, Sunday Worship services. Children ages preschool through 5th grade meet at 9:45 a.m. for Sunday classes. Students learn Bible stories through reading, crafts and games, helping them to understand how to apply those Bible lessons and grow as disciples. Following the “Moments with Children” during the 11 a.m. Worship service, Kid’s Korner is available for children ages three to six, and CORE invites those who are in Grades 1-5. “Quiet Bags” filled with games and art materials are available to children remaining in the sanctuary during the Worship service – these can be obtained from the ushers. Also Kids Binders are provided for those children who might be too old for the Quiet Bags. 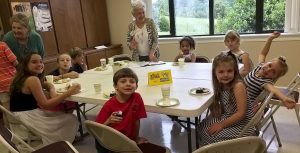 Throughout the school year, children ages pre-k through 5th grade are invited to Wonderful Wednesdays for an evening meal followed by a theme-based children’s Bible study. 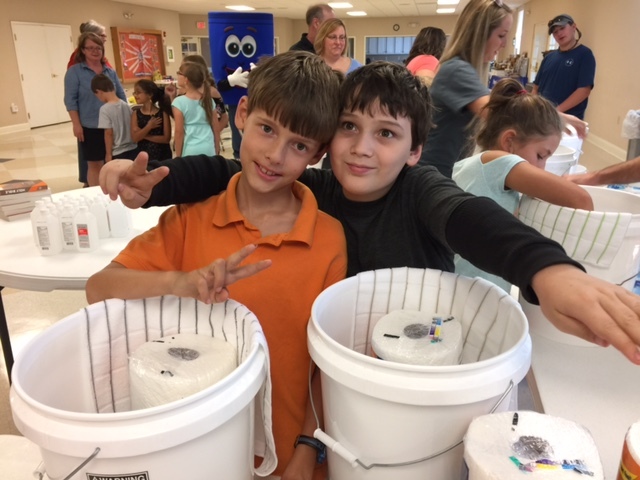 Fun-filled lessons with music, crafts, snacks and service projects like Bible Super Heroes, The Heifer Project, Fruits of the Spirit and more. 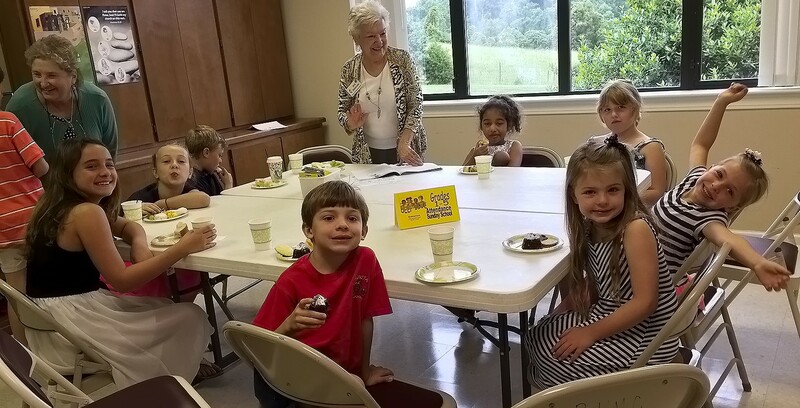 Every summer, children pre-k thru 6th grade throughout the community join us for a week-long Bible School with a special Biblical theme, crafts, food, fun and singing. It’s always a delightful time, enjoyed by students and teachers alike. See photos from VBS 2017. Bethlehem’s Preschool was established in 1984 as an outreach ministry under Christian Education. Children are encouraged to develop spiritually, physically, socially, mentally and emotionally while gaining readiness for public school. Four year olds meet three days per week; three and two year olds meet (separately) two days per week, September through May. Please see the Our Preschool Page for more information.